A campsite offers an affordable and exciting environment where there are plenty of activities for kids and adults alike to learn, exercise, and have a great time bonding in the outdoors. 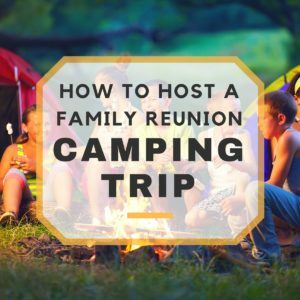 Here are a few tips for holding a camping family reunion. Did you know that most campsites, especially state and national parks, reservations are a necessity! Camp sites can fill up, especially early during the summer and three day weekends, and the spots with amenities (electricity, water hookups, etc) go first and fast. Try to book the campsites as early as possible so you won’t be scrambling for tent spaces. Lots of parks have specially designated “group campsites” that are perfect for gathering the family in one site. Include a suggested packing list: Some people in the family may never have camped before! By letting everyone know what they will need, you can help make sure everything goes smoothly. During the hot summer, suggest bug spray and sunscreen, extra towels and loose fitting clothing, just in case of sunburn. Better prepared than not! Figure out what the cooking facilities are, and make sure there is a meal plan. Even if you are just car camping, some sites may be far from the nearest grocery store or restaurant. By planning ahead you can spend more time having a reunion, and less time driving around hungry. The camping environment can be a great opportunity for both adults and kids to try out new things. For example, if there is a family member who is an amateur astronomer, they can give everyone a lesson on stargazing under the bright night’s sky, out in the wilderness where there is less light pollution. If a different family member is an avid hunter, they can teach everyone about tracking. The skills don’t need to be unique to the outdoors either. Are you a master barbecuer? You can teach people how to grill over an open fire. Everyone has a camera in their phones nowadays, even the young ones! You may be without wifi, but the camera on the phone can still take and save great pictures. Make sure to record the wonderful memories you’re sure to make! Having people share their special skills can be a great icebreaker for family members you haven’t seen in a long time or never met, and it is a terrific way to get everyone engaged while providing some structure to the family reunion. While sharing hobbies and talents is great, a little sibling (or family) rivalry can be a fun way to add a competitive element to the activities. One fun thing to do is to make a gourmet s’more contest. For this, first split up into teams of 4 or 5 people, or just by family units (but this can be tricky at multi-generational reunions). Then it is up to each team to come up with and create the fanciest, most gourmet and delicious s’more they can. Some ideas for ingredients to help get you started are marshmallow fluff, caramel, banana and peanut butter. Make enough for each team to try one, and then one extra — the winning team can collect this as a bonus! After everyone has feasted on s’more and have changed into their pajamas, the same teams can compete with each other around the campfire to see who can tell the best family story. To make the activity last longer, and to give each team more opportunities to win, you may want to have a few rounds with different themes. For example, one round could be the best baby story, and the next could be the funniest story about meeting a future husband or wife. There is no end to the topics you can do, and then, once the youngest kids have been tucked into their beds — err, sleeping bags – those who are still up can finish off the night with some scary ghost stories. Note: Make sure you check with a campground supervisor or park ranger before leaving or burying anything on the grounds. In some areas this may not be permitted. Time capsules are more than a fun way to save memories and artifacts from a time that has passed. They are also a sort of promise to come back and retrieve them, which can mean another family reunion in the future! Adults can have a blast filling up a time capsule with pictures from the family reunion and coming up with fun questions and answer forms to put in it, like how much they think a gallon of gas will cost, or who will be president when the time capsule is opened back up in X years. It is great for kids too, because they can put in their plans for where they will be when it is opened up again. Perhaps the most exciting part can be hiding or burying the capsule. Kids can make a map to show the exact location so that in 1, 2, 5 or even 10 years to come back and retrieve the information. Here at Everywhere Chair, we hope you have a wonderful, safe, and happy summer season. Get out and enjoy the weather – don’t forget the gear– thanks for letting us be a part of your fun in the sun! Please like us on Facebook and follow us on Twitter and Instagram for more ideas, specials, and fun contests.